The Tamworth Phoenix Committee last night sent an email to the current BAFA Directors highlighting a potential insurance breach with reference to Leicester paying players. This follows a conversation in which a Baker University player attempted to broker a deal with the Tamworth Phoenix to play for them. The League’s stance on paying players remains that to do so would invalidate the insurance the League has in place, meaning players would be unable to claim, or be protected from liability. 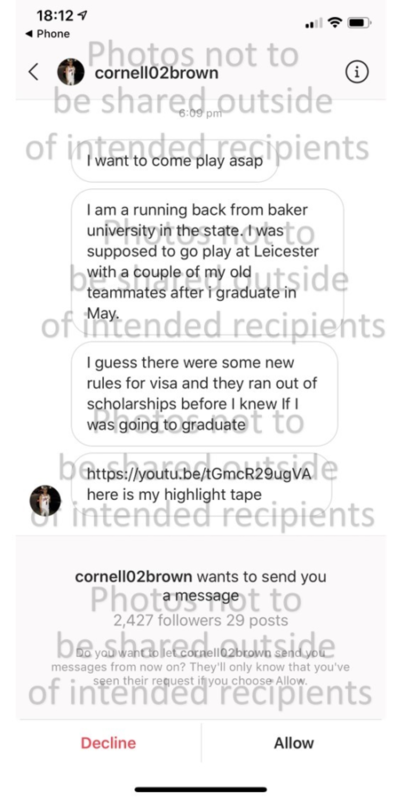 Please find attached screenshots from a conversation between a Baker University Football Player and our team Instagram account. This conversation shows Leicester Falcons’ intent to make payment to a player. This player states they are not playing for Leicester as they have “run out of scholarships”. Therefore, it is reasonable to infer that any other players representing Leicester this season, as a result of the partnership with Baker would be receiving payment. This would be a direct breach of the league competition rules, item 2.7. This is deeply concerning due to the potential risk to BAFA members. The current league insurance is based on amateur status. Our athletes rely on BAFA and pay membership fees to ensure their insurance is valid. Not to mention the unfair advantage Leicester are looking to achieve by wilfully ignoring the rules of the competition. Should BAFA have any questions over Leicester’s financials it is within their right under item 4.4 of the BAFA regulations to request a copy of their most recent accounts. We believe it is our duty as a BAFA member to report this issue, as it puts the whole sport in this country at risk just as it looked like we were starting to take a step forward. We do not believe there is any benefit in making this issue public. We do however intend to notify the other 10 premier division teams about this issue due to the potential risk of their member’s insurance being invalidated in a fixture vs Leicester. We look forward to you response. If you wish to discuss this further, please contact us. No statement has yet been officially released by BAFA regarding the allegations. While what has been provided can not be considered a smoking gun in terms of evidence of paying players, it is perhaps enough for BAFA to investigate further. This is potentially another embarrassing situation for the National Governing Body as the owner of the Leicester Falcons, Guy Kersey, recently took a role at BAFA as the interim Events Manager. Kersey also owns a majority holding of the deteriorating UK Media outlet ‘Double Coverage’ as well as an attempted breakaway UK league called UKAFL with his business partner. Been pulling shadey crap like this for over 10 years!!! Nothing ever gets done about it……. Same old Leicester always cheating!